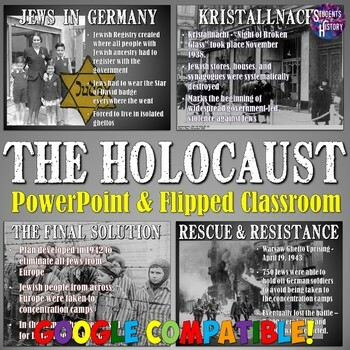 This resource on the Holocaust provides a PowerPoint and "flipped classroom" lesson from a background on the Holocaust through liberation of the concentration camps and the Nuremberg Trials. 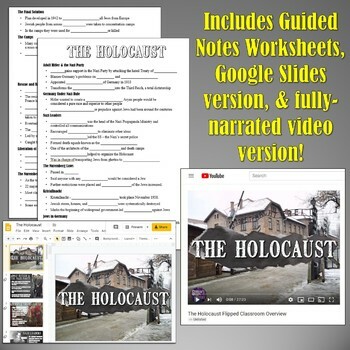 Each slide includes gripping photos and the tragic history of the Nuremberg Laws, Kristallnacht, the Final Solution and the camps themselves. The notes are also easy-to-follow and focused in on essential understandings. The PowerPoint also includes slides on resistance groups like the White Rose, the French town of Le Chambon-sur-Lignon, and the Warsaw uprising. 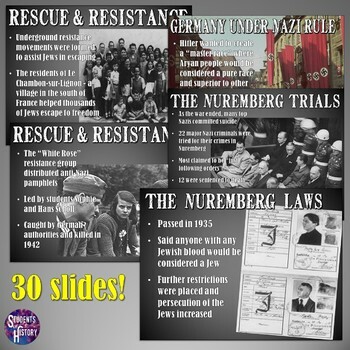 It concludes with slides on the liberation of Auschwitz and other concentration camps, the Nuremberg Trials, and an embedded Youtube video about camp survivors. The download includes a fully-narrated 26-minute "flipped classroom" video of the presentation. This is perfect for "flipping" your class, providing to absent students, using with a sub, or just prepping before your own presentation! Also included are guided notes outline worksheets for students to follow along and a Google Slides version of the presentation! For an excellent companion lesson plan, please see this fantastic Nuremberg Trial Simulation Lesson Plan! 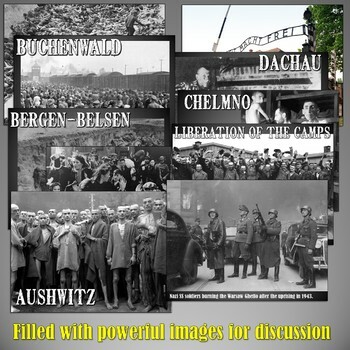 Both resources can also be downloaded as part of the Holocaust and Genocides in History Unit Bundle. You can "Like" my page on Facebook for updates, giveaways, links and more! Thanks for looking!